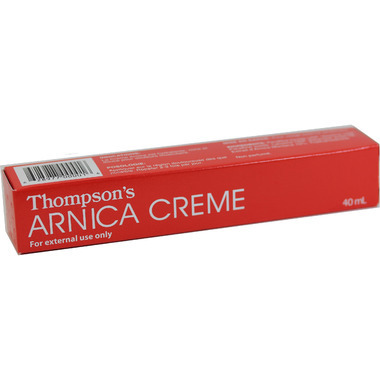 Thompson's Arnica Creme is a rich moisturizer that is safe and gentle for overused and tired muscles. Fragrance, colour and preservative free. No animal testing. Directions: Apple to affected area as soon as possible, repeat 2-3 times daily. I had a tube of this stuff around for years and never used it. Suddenly got a very weird pain in my hand out of nowhere and thought about the arnica cream (which my deceased husband swore by.) I went and got it and applied it and literally minutes later the pain was gone. The next day it came back but not as strong and I did the same thing...gone. The third day it came back very weakly and I applied it for the last time and haven't had that pain since. I immediately ordered another tube and gave it to my friend with arthritis but haven't heard back. Works well but it's such a tiny tube. They stopped carrying our usual brand so we had to try a new one, but I think I'll have to find something else. Great for strains and sprains and overworked muscles. Very pleasant, mild, natural smell so you can use it anytime.